I have been trying to get a good shot of a Dark-eyed Junco. They flit faster than I can catch them. They are here all winter, but mostly down on the ground. But when the ground is fast covering with snow, as it is today (“Winter Storm Iola,” says The Weather Channel) they get closer, looking for seeds on the deck railing (I clear it regularly) or platform feeder. The dark-eyed junco was described by Linnaeus in his 1758 Systema naturae as Fringilla hyemalis. The description consisted merely of the laconic remark “F[ringilla] nigra, ventre albo. (“A black ‘finch’ with white belly”), a reference to a source, and a statement that it came from “America”. Still, at least the slate-colored junco is unmistakable enough to make it readily recognizable even from Linnaeus’ minimal description. Its modern scientific name means “winter junco”, from Latin hyemalis “of the winter”. 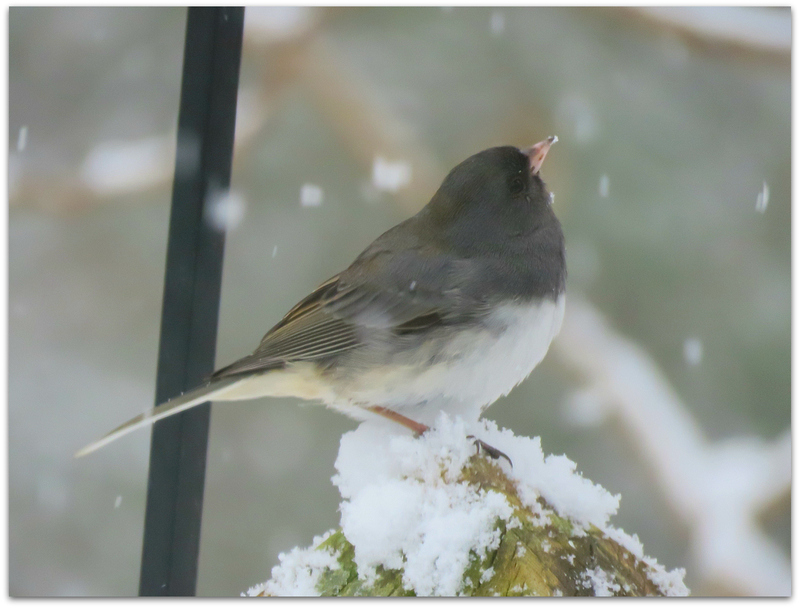 This entry was posted in Uncategorized and tagged birds, Dark-eyed Junco, Linnaeus on January 24, 2015 by Amy. We have Juncos in the winter only. They usually mingle with the sparrows, eating the seed I toss on the ground. And they do hop around quite quickly. I’ve had them in the eye of the camera for perfect pictures, only to check the camera after taking a shot and seeing nothing but ground! That’s a very nice shot you have there!